YOU MUST FILL OUT AN APPLICATION, as we do not hire from resume only. All applications and resumes are confidential. Click to fill out an online employment application. Click to download a hard copy of our employment application. • You may also stop in at our location and fill out an application. 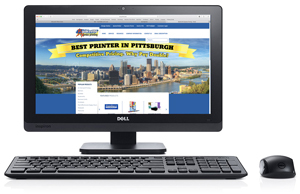 Banksville Express Printing, family owned since 1982, is a reputable printing / digital company in the Pittsburgh area who is looking to hire a full time Customer Service Representative / Receptionist. Must have a high school diploma or equivalent education. Must have some computer skills. Will train. Applicant must be energetic, hardworking, have very good people and communication skills. Must have excellent math skills and the ability to pay attention to details. Manage projects that involve a wide range of high quality printing. Be positive and friendly. If you are willing to learn you should excel in this position. Some of the position requirements are to help customers in person as well as receiving phone calls and emails from customers to help them with their printing needs, provide quotes, process orders and provide invoices upon completion of the work. Very competitive base salary plus commission will depend on experience. Benefits include medical, dental and life insurance. We offer a Simple IRA retirement plan, paid holidays and vacation.